Orangutan Island (OUI, Bukit Merah, Perak, Malaysia) is a rehabilitation center established in 2000. Environmental Enrichment is important for rehabilitation of animals as well as for animal welfare. Since we should encourage orangutans to develop and maintain species specific behaviors and cognitive abilities for successful reintroduction to wild. 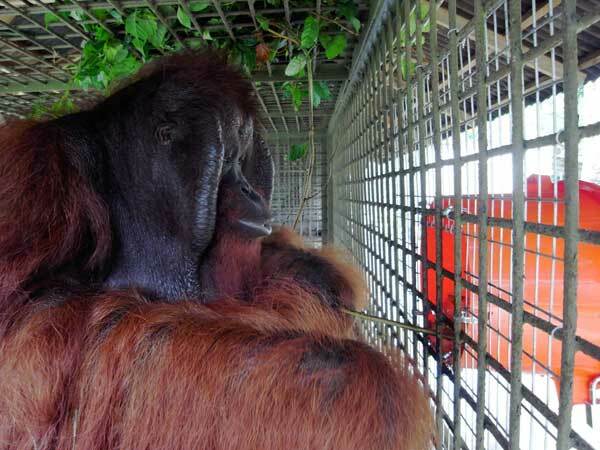 Therefore, as part of the collaboration between OUI and PRI, I stayed in Bukit Merah from 30th November to 21st December, 2010 to provide environmental enrichment on two orangutans in backyard cages and assess the effects by behavioral observation. The environmental enrichment provided was as follows; physical enrichment (attaching fire hose or tire rope and putting branches on roof) and feeding enrichment (attaching feeder and juice container to cage bar). The behaviors were observed 4 to 5 days before and after enrichment for each individual. The orangutans used all the enrichment items and, as a result, they increased behavioral diversity. For example, they used tool, made from branches, to get food from feeder and they put branches on their head under heavy rain. These behaviors were similar to those observed in wild. I am now working on further analysis of behaviors including feeding and stereotypic behaviors to assess the effects from the view of animal welfare. An orangutan used tool to get food from feeder. 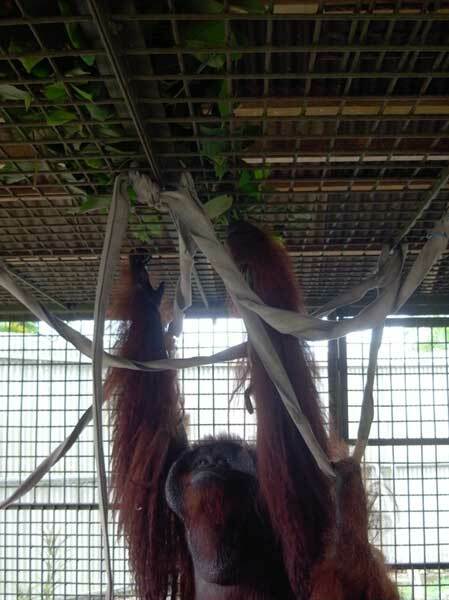 An orangutan obtained branches from top of the roof, using fire hose.